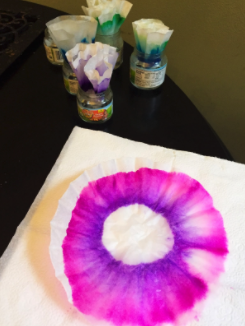 The Chromatic Color Circle activity from Color Physics Camp explores science through art. It reminds us of the colors of spring; blooming flowers, bright butterflies, a vibrant world waking from it’s winter slumber. Kids of all ages love this little activity, and it’s great because the older they are, the deeper their understanding of what’s going on, and the more science you can discuss with them. ​Read on for some concepts and questions to talk about with your kids while doing this activity. ​​Don’t want a table full of marker mess-ups? Don’t have room to string a drying line? Traded in all your coffee filters for a pod coffee system? Bring your kids to one (or more) of our Summer Camps! We’ll provide the community, the science, and clean up the mess. All you need to get started are some white coffee filters (they must be white), some little containers to hold water (leftover baby food jars are perfect, but small cups work well too), some fresh markers in fun colors, and preferably, a pencil. Some pipe cleaners and a few beads are also nice for kids to make butterflies, flowers, or funky colored aliens out of their circles. ​Also, if you have the space, it’s helpful to set up a drying line or a place near a window with a few paper towels to lay out the finished circles to dry. 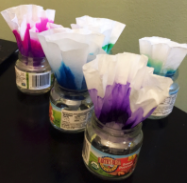 Either way, you’ll need a place to put these beautiful bursts of color while they dry. TIP: Though this project isn’t too messy, markers can bleed through the coffee filters, and pigment can drip or bleed after the colors have separate and are still wet, so it’s helpful to lay down butcher paper or other table coverings before starting. ​Has a picture you’ve drawn ever gotten wet? While they are thinking about what happens when art gets wet, help the kids fill their small cups or baby jars with about ½ inch of water. Choosing a single color marker, tell the kids to write the name of that color on their filters in pencil. Next have them color a thick ring around the middle of the coffee filter. They must not color in the middle. When they are done, the kids should lightly scrunch the filters into a loosely bunched cone, with the blank middle area at the bottom. Make sure not to fold tightly. The color will bleed. 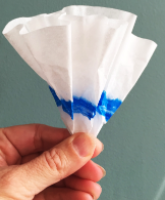 When the water reaches the outer edge of the filter or the creator wants to stop the spread of color, remove the filters and hang them on the line to dry. 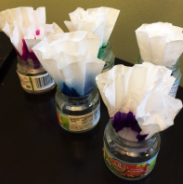 After kids have made, discussed, and dried their circles, they can use these beautiful chromatic bursts to make flowers, butterflies, aliens, or whatever their amazing imaginations come up with! Here are a few relevant topics and questions we like to discuss at camp, depending on the age and interest of any particular group. They are great ideas to get started, but have your internet ready to look up whatever you can’t answer. It’s great for kids to see how to investigate unknown questions. ​Why do you think it’s happening? 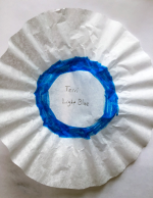 The water spreads up the ABSORBENT coffee filter, and moves along with CAPILLARY ACTION. The marker is WATER SOLUBLE, which means it loses cohesion/ gets all soft and wiggly in water. The water then carries the color along as it continues to spread across the filter. As the water (and color, which is now liquid) spreads, it DILUTES, or becomes less intense. The different colors that make up each color spread out. CHROMATIC, in this case, means relating to a color. The different base colors within each marker color separate and stop at different points while the water spreads, leaving them in rings. The water only moves outwards because it is moving into the dry areas. What do you think will happen in the next 10 minutes? Do you notice anything about the different colors? What happens to blue that is different from pink, or orange that is different from red? Some colors are made by mixing other colors together, like how yellow and red make orange. But each color will be moved along by the water differently. So some color will travel further along the filter, and other colors won’t. The colors that were mixed together to make the marker you originally used got separated again because of how the water affects them.